Before she attended the 'Snatched' premiere, Kate Hudson attended her Fabletics launch of the Demi Lovato Fabletics Capsule collection which was held at The Beverly Hills Hotel, Crystal Garden in LA. 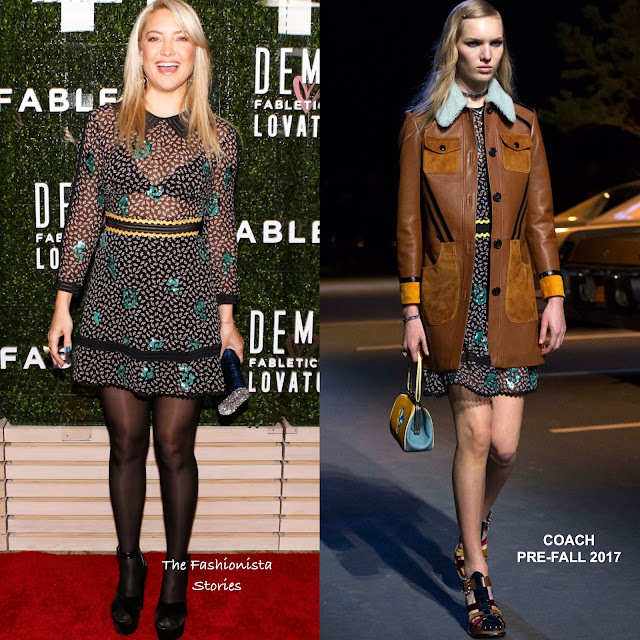 She posed on the red carpet wearing a COACH FALL 2017 sheer long sleeve black & white printed dress with green sequin panels, lattice cut-outs and a yellow embroidery. Kate wore a black bra underneath & lined the skirt for coverage. For a garden party in LA, It think she could have work sandals only but instead she wore sheer black stockings with black platform sandals. Straight tresses, a navy & silver clutch and statement jewelry finished up her look. Are you feeling Kate's look?